Show a fashion girl a box of jewellery and we guarantee she'll be there for hours trying things on, creating fresh combinations and flitting between favourites. We're all magpies deep down, and certain brands act as a complete go-to, no matter what you're looking for. Thomas Sabo is the holy grail, providing everything from classically cool, minimalistic stackable items and layering necklaces (complete with perfect pendants) all the way through to more trend-driven items that can provide major impact during any given season. They've even updated the concept of charms, introducing an easy-to-achieve eclecticism with their statement-making mix 'n' match trinkets. Whether you're looking to reboot your own jewellery collection with something timeless or more of-the-moment, we have the answers below thanks to our deep dive into the latest collections from Thomas Sabo. As the affordable luxury name when it comes to covetable rings, bracelets, necklaces, charms and more (think hand-finished pieces crafted from 925 Sterling silver, finished with 18 carat yellow or rose gold, and studded with semi-precious stones) we got to work, cherry picking their key looks so that you have a one-stop destination for all your chic jewellery needs. Oh, and if you're on the hunt for the most thoughtful Christmas gifts, this gallery will help on that front too. 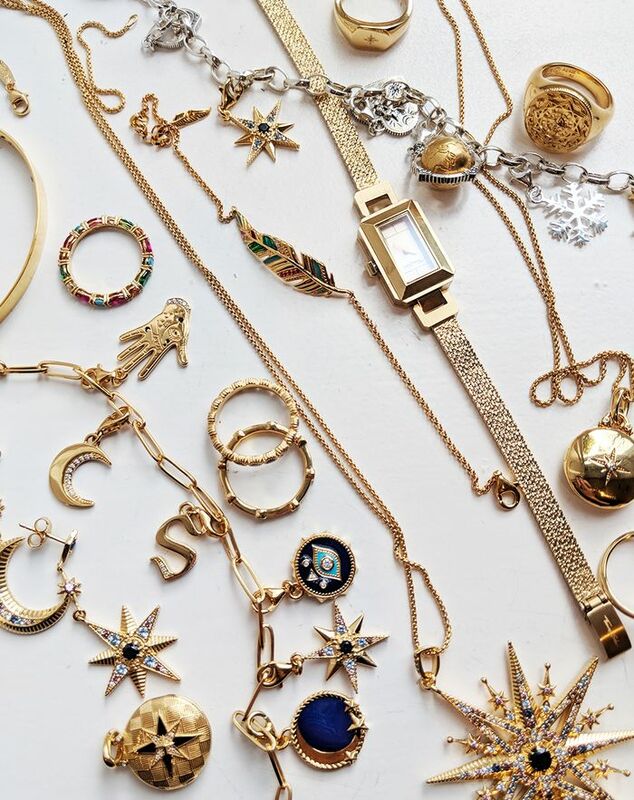 Style Notes: If you're looking for a fast injection of newness, one of this season's best—and most sophisticated—jewellery trends revolves around moons and stars. Great for party season with a little black or red dress but equally appropriate for your work or weekend attire, people will ask you where you found such magical items. You should direct them right away to the brand's Kingdom of Dreams range. Make like the Instagram set and ensure that you're layering up your pendant necklaces for the most on-trend look, and don't be afraid to match your chosen necklaces with matching rings or earrings—that kind of grown-up attention to detail will instantly upgrade your jewellery collection. Style Notes: Still finding your groove with day jewellery? We've come to the conclusion that it looks best when it's relatively plain (simple signet rings, bangles and elegant, understated watches) but stacked creatively and with a subtle blend of gold and silver metals. These pieces are more minimalistic, but you can still have plenty of fun—a classic charm bracelet, complete with kooky trinkets, will never fail to provide fashion kudos and offer up potential talking points. P.S. see the charm bracelet pictured here? If you buy it (before Dec 31st) you'll receive the heart angel charm for free—a doubly great gift idea. Style Notes: Plenty of us will have owned charm bracelets or necklaces in the past, but Thomas Sabo have really upped the ante in this department with the newly relaunched Generation Charm Club collection, making them entirely cool all over again. It's thanks to a wide array of quirky, vintage-looking charms that can be so easily curated to feel unique and individual to you. We'd recommend making the most of this season's blue enamel pieces, initials and multi-coloured gemstones for a truly standout look.